High-quality multi-strain Acidophilus and Bifidus probiotic dietary supplement. 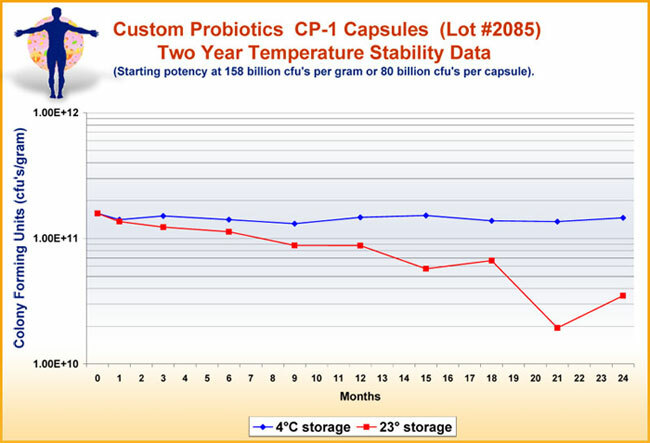 High bacteria count provides 60 billion CFU's per capsule at the time of expiration.90 capsules per bottle. Start with one capsule (60 Billion cfu’s) first thing in the morning (30 minutes prior to eating) and one capsule at bedtime with a full glass of water. Continue this dosage for three days. After three days raise the dosage to two capsules first thing in the morning and two at bedtime, if need be. Continue for 3 days. If you are not getting the expected results, raise the dosage to three capsules first thing in the morning and three at bedtime. Remain at the dosage that works best for you. NOTE: Every digestive system is different and unique like a fingerprint. You need to find the dosage that best suits YOU. It may be one, two, four or six capsules per day. This gradual increase is a good way to find your optimum personal dosage. Q. At what age can child take the Adult CP-1 Capsules? A. It depends on your child and if the capsules are easy for them to swallow. We have customers as young as 5 years old taking the capsules. If you are not comfortable with your child taking a capsule we recommend the Infant or D-lactate formula. I am very happy with the results of the D-Lactate Free Probiotic. Tomorrow it will be a week of taking the adult dose 1x per day. Thank you! I have already reduced my antidepressant by 37.5mg and hope to continue slowly reducing. AMAZING! I just wanted to send you a quick email to let you know that the very sensitive little 18mth old patient I had who was allergic to so many things has had great results from your probiotics. It has been a long journey to find one that didn’t contain traces of soy, corn, dairy, wheat, salicylates, sulfites, egg, or nuts in the end product. It was really helpful of you to reassure me in this regard.The little boys’ eczema has vastly improved and doing really really well on this product. Every other probiotic product available in Australia gave him a reaction. I've tried quite a few probiotics and Custom Probiotics are my favorite. While they may seem more pricey, they pack a whole lot more punch (and CFUs) per pill. Just one in the morning does the trick - I prefer to take it on an empty stomach, at least 30 minutes before eating, typically with water or coconut water kefir. Yummmmy probiotics! Enjoy! I have been taking this product for a few months due to a bad systemic Candida infection. Like other probiotic products I have tried, this one did not upset my stomach or produce any ill feelings. I am now finally enjoying my life again. My chronic sinus congestion, stomach pain, fatigue, constipation, skin rashes, brain fog...all gone, and I have my health back. I highly reccommend this product to anyone, especially if you are suffering from candida!I usually order this through Amazon but they recently ran out of this product so I ordered it directly from Custom Probiotics. When my package did not arrive on time, I was skeptical to call due to the previous bad review of the owners verbal abuse over the phone. However, I called Custom Probiotics and spoke with who I believe was the owner. He was very helpful and advised me that they had ran out of their product and just received another shipment. Per his request I Emailed him my order information and within minutes he forwarded me the Fedex tracking info and sent my product out to me! Very impressed with the service I was provided! Everyone should spread the word to family and friends about this amazing product! This stuff is, no exaggeration, the best probiotic I have ever used. I had near total gut flora die off after battling chronic lyme disease, and all other probiotics failed to re-establish a colony. It comes shipped in a cold pack, and it's small bottle, filled tightly with capsules, that stores in your fridge easily. Just wow... this is the best probiotic I have ever used. From GI issues every day, to about 10 weeks later (2 pills/day for now) having no gas, constipation, diarrhea, etc. I had given up on probiotics but I am glad I gave this one a shot! Also as an added bonus, I feel more energy/positivity throughout the day.. a healthy GI tract really does help the mind. I have been taking these Probiotics for years and I highly recommend it. I hardly ever get sick anymore and my digestive system is normal again, thanks to this product! I do watch what I eat now, eating more whole nutritional foods, but I believe Probiotics are essential just like vitamins. This is the only probiotic that really works for me! will never go back to other companies.I discovered, this company, when I visited a wonderful and gifted holistic Chiropractor/Doctor in Pennsylvania.The doctor, highly recommended this company. I used to get the powder. Now I prefer the convenience of the capsules. Of course, it must be kept in the refridgerator. You will never be unhappy with this brand. It does seem a little pricey, but I have tried so many other brands, andthis is NUMBER 1 in my supplement list. So far so good! I have completed about half of the jar, and I am experiencing better BMs. I intend to purchase more of the same brand and to continue better bowel management. It helps me so much to go to the bathroom. I only take one in the morning before I eat anything ... it says y can also have one in the night but with one I have enough. I feel so much better !!! Absolutely recomen this if u have problems with your stomach. I didn't really have problems but I notice my stomach feels so much better. After having each of my 4 children, while breastfeeding them I struggle with yeast (for me) and thrush (for them) for the duration of nursing them. These are the only probiotics I will use to keep the yeast at bay. I trust them enough to even give them to the baby. They've made it possible for me to continue breastfeeding for a year each time. Thank for making such a quality product. Thank you, and that’s such a wonderful service that you offer. I have been suffering with a lack of beneficial bacteria for years resulting in issues of low resistance to colds, flu etc., sinus problems, inflammatory bowel issues, digestive disorders etc. I take Custom Probiotics CP-1 on a regular basis with great results that dramatically improve these issues if not alleviate them completely. I realize the benefits of CP-1 the most when I run out of the product. When I am not taking CP-1 I am much more susceptible to whatever flu or cold bug is going around, and my digestive and gut problems reoccur. I am forever grateful for this fantastic product. Hi Harry, Question: I am a recent happy customer, and currently taking your 11 strain powder (which is great). I am ready to place another order, and would like to know if it is it possible to add a single strain L. Plantarum to the bottle of your 4 strain Bifidobacteria. If so, what is the process for ordering a 100 gram bottle of the 4 strain bifido—with L. Plantarum added? I’ll also be ordering a couple of bottles of the CP-1. Thank you so much. I love your probiotics and am so grateful for all of the help these have given me. Years of taking other probiotics have not yielded the results that yours have in a matter of weeks. I just wanted to let you know I am such a fan of your Adult Formula CP-1 ACIDOPHILUS AND BIFIDUS (50 billion microorganisms per capsule) product! A woman I know recommended them to me. I didn’t think they would work but let me tell you I am so grateful I stumbled onto your product. I am 32 years old and since the age of 15 I’ve suffered NON-STOP from ACNE. Horrible, huge, non-stop, never ending acne. I tried everything and anything for years except probiotics because I didn’t know about them until recently. I’ve been on antibiotics many times for various strep throat infections. I was even on antibiotics for 3 months because the dermatologist said it would clear my skin. It did temporarily, but I stopped for fear of immunity to antibiotics. Plus I developed a painful yeast infection from being on antibiotics for so long. So I tried various other methods, creams, harsh cleansers, steams, acne pills, scrubs, lotions and potions with very little, temporary improvement. I gave up and just resorted to using make-up as a cover up. I spent a lot of money on various products. Then I stumbled on your product, and to my amazement, I swear on my life, it is the ONLY thing that has worked!! If not for your product I would still be battling acne. I guess my stomach was all messed up from all those antibiotics. I needed to repair the damage. I follow the label instructions and I take one capsule 3 times per day. I have been living acne free for the past year. I no longer get zits. Acne is understandable as a teen, but to have it thru your 20’s and even hit 30 and still get it, well that is the most frustrating thing. I’m so sorry I didn’t find your product 10 years sooner. I will be purchasing some of the children’s formula for my daughter. And one more thing, I feel so relaxed and I am able to sleep better now, plus I have more energy. I feel more balanced. My daughter says all the time: “Mom remember when you used to get zits all the time? Your skin is so clear now.” I just wanted everyone to know of the skin benefits of your probiotics. For me, it was the ONLY thing in the world that worked. Dear Harry, I just wanted to thank you for your CP-1 product. I have been using it on my son along with cytoflora and we have had a lot of success. Better sleep, better skin, more balanced mood and toenail fungus that has been very difficult to treat is also clearing up! My daughters persistent eczema has also disappeared (she has had patches for over 2 years despite dietary interventions and enzymes). Harry, For most of my adult life I have had sensitivity to dairy, which was never really a big deal to me. It was tolerable, living without dairy. Unfortunately, however, for the past five years I have had symptoms (extreme nausea, migraines, fatigue) as a result of unknown other colonic/gastrointestinal problems. I mean, I was feeling “sick” five days out of seven, wondering when this would pass. It was horrible. My quality of life was as low as it could be. After many doctor’s visits and many trial periods (of consuming no gluten, then no red meat, and lastly no raw veggies or beans, etc) the only conclusion reached is that I have IBS. Being a vegetarian for many years it was hard for me to accept the fact that I am now, for some reason, particularly sensitive to raw vegetables, breads, pastas, even some cooked vegetables. Quite thin already, my “new” diet resulted in my losing yet more weight and therefore a severe decline in my energy level. This brought on a slight depression, mainly from guilt of not being able to play “hard” with my kids anymore. I was always into sports and very active, so this was a nightmare! Having to nibble on rice, corn, and only a few other foods and then being tired most of the time? I felt as if I were being cursed. Being very unsatisfied with the vague diagnoses from doctors, I thought I would try probiotics. A friend mentioned them to me a few years ago. I happened upon your website and decided to order some. Your CP-1 formula, which I take once in the morning and once at night, has worked absolute WONDERS! At first I didn’t think it was really going to work but after only a week or so I started feeling healthier and took a few risks with my eating habits. What a pleasant surprise it was to have some fruit and bread without paying the price later on. Seriously, I cried with joy, thankful for not only myself but for my kids, who are happy to have their active, healthy mom back. No more headaches, gas, or fatigue! The curse has lifted! Now I am eating my favorite foods again – loaded salads, homemade breads, nuts, fruit – without miserable consequences. As a family, we’ve gotten to enjoy buffet meals at restaurants again because the meals don’t have to revolve around my (formerly!) strict diet. What a wonderful relief! My quality of life has improved 100%. Instead of feeling SICK five days out of seven, I am feeling energetic and healthy at least that often! It is amazing. Truly. I cannot praise your product enough. I’ve already told all of my friends and siblings about your product and what it has done for me. I’m not a doctor, and I don’t yet know what caused the sudden onset of my current food sensitivities, but I do know that Custom Probiotics CP-1 formula has enabled this woman to eat and feel as healthy as possible. I am 51 years old and had Candida yeast for about 20 years. I have literally tried every prescription, and over the counter medicine to combat my issue, along with the Candida diet. I saw several doctors and followed the treatment plan, for the Candida to return after stopping the plan. Nothing has ever worked! I kept thinking it’s all in my head, while I was going crazy with the symptoms. Thankfully I found your web site, and started taking the Probiotics… I am on my 3rd bottle, which I take 4 per day and can truthfully say, this is the BEST product for Candida Yeast. My condition has improved by 90% and I feel that it will soon be history. Thank you for such a great product that really works! Hello Harry, Thank you for you wonderful probiotic! I am a 45 year old female with Crohn’s Disease since I was 28. Over the years, I’ve used many prescription medications and I’ve had a bowel resection in 1999. All the medicines and treatments seemed to have given me short term relief. About 1 year ago, I started using your Adult CP-1 formula starting a 1 capsule per day. I have experienced much relief since using this product. I informed my Gastroenterologist that I’ve been using this and he said “ok”. Using a probiotic was never mentioned to me by any of my Physicians. I found out about this product by a Nutritionist. A few weeks ago I had my yearly colonoscopy and was told that my disease is “not” progressing since last years colonoscopy. This is a huge positive for me. I will continue to use this product and possibly increase the dose to see if a higher concentration works better for me. I feel like this has given me more energy, and is positively affecting my disease and my overall wellness. I don’t feel as tired as I used to feel. Hopefully in the future I might be able to decrease or even discontinue all the prescription drugs I currently take. I have nothing but good things to say about this product. Harry, I just wanted to tell you how effective I think your CP-1 formula is. I have Lyme disease and have been taking your probiotics in between my antibiotics and herbs for about 2 months. I think they really keep my gut in line now. They seemed to have also straightened it out from before the antibiotics, when I wasn’t feeling well almost constantly. I tried some of the other brands of probiotics but they didn’t seem to be potent enough. I usually take one at night before bed, a few hours after my evening antibiotic dose. They seem to help. Just thought I’d drop a line. Dear Harry, I thank God for bringing you into my life. The probiotic pills I take have raised my immunity and I no longer get fungus infections around my finger nails. They also have stimulated my overall appetite. In a nutshell, probiotics has changed my life for the better. Hi Harry, For seven years I was unable to tolerate ANY dairy products without breaking out with red swelling and ugly, itchy blisters on my forehead. After trying custom probiotics CP-1 formula, 3 capsules a day, I am now able to enjoy all kinds of dairy products without any ill effects. It's like being let out of a prison. I'm very happy with the results. Harry, WOW!! I am so excited to tell you that your product has changed my life. Growing up I had kidney problems and infections in which my doctor had me on antibiotics everyday for 7 years straight. I am 33 years old and I have had candida for as long as I can remember and the last year and a half I have had colitis. I have only been taking your Adult CP1 for two months and I have no more bleeding, no more mucus and no more spasms. Only those who have suffered with colitis can understand the desperation one will go to find a cure for them when conventional medicine does not work. My medical doctor wanted to put me on steroids and I had enough smart to know that would only make things worse plus make me gain weight. If I had taken the steroids I believe that would have grown the existing candida and make me even more miserable. I have tried other probiotics and changing my diet but I could not understand why nothing was working. Now I know why the dosage was not high enough to restore my health back. The former products of probiotics was only 1 billion in each pill that means that I would have to take about 400 pills a day to equal the 6 pills a day I was taking with your product. I thank God for you Harry and your probiotics! Thank your for helping me and many other people who have lost hope for a cure. Harry, Your product has literally saved my life. Anyone who has suffered from Crohn's can tell you, the pain is unbearable. I was at the end of my rope. The conventional medicines had not worked, nor had they stopped the bloody diarrhea, which had gotten so frequent that I was literally too weak to do anything. In July, 2003 I was awaiting my second Remicade infusion when I came across your web site. I had nothing to lose, so I tried your Adult Formula CP-1. I began with four capsules three times/day and noticed an improvement in two days, yet I still suffered from cramping and bloody diarrhea, yet milder. You then sent me the powder form , which I mixed one scoop with water three times per day and THE NEXT DAY THE PAIN, THE DIARRHEA AND THE BLOOD were gone. About a week of being on the powder form, and feeling better than I had felt in a year, my doctor performed a sigmoidoscopy and said "this is not the same colon, it's gone". I have now been off all Cohn's medicine (Colozal, Pentasa, Entecort) since November 26, 2003 and have never felt better. My doctor has no other explanation for my recovery, it has to be the probiotics. I have been on the Zone diet for the last 5 months and have done quite well with that. It pretty effectively controls my indigestion and heart burn. But during the holidays I have cheated some. Yet with your product for the last couple of months I haven't experienced any heart burn or loose stools. And gas has been at a minimum. Even when I eat the horrible combination of pizza and chocolate in the evening. So I am very happy with the results. In fact I feel terrific. I am taking the ADULT FORMULA CP-1. 2 in the morning and 2 at night. Harry, I have to tell you how much I appreciate your product. My 7 year old daughter with autism has had a chronic, acute problem with clostridia, so severe that the by-product of this harmful bacteria was causing brain damage. She had lost all speech and her ability to walk. We had tried several probiotics on the market, but she was not responding to them. After completing a round of Vancomycin, we started her on your product at three capsules a day. It has been 2 months and we have the clostridia under control! She has regained almost all of her speech as well as her ability to walk! Thank you so much! With your product, I know that we are on the road to better health! Your CP-1 has helped my Colitis/Irritable Bowel Syndrome symptoms. I had blood and mucous. They are both gone. My stool frequency is more normal, also. I take 5-6 capsules each day. I have tried many of the top probiotics, but yours are the most effective for me. As you said, results are the only things that count. Please continue the good work with the same effective strains of probiotics.